If you freelance – whether that’s writing, editing, mentoring, or offering any other type of writing service to clients – there will come a time when you want to raise your rates. This is a normal, and inevitable, part of doing business. But it can also be something that freelancers really struggle with. “I’m going to start charging you more” feels like an awkward conversation to have … plus, what if your client says they then can’t afford to hire you any longer? Maybe you’re thinking it’d just be easiest to stick with your current rate … forever. Or maybe you feel like it’s not appropriate for you to charge more: you’re still providing the same service. #1: When you first start freelancing, you may not have much experience to draw upon. Hopefully your work will be perfectly competent … but it might not be great. After months of freelancing, you’ll have far more experience – and a better understanding of what works and what doesn’t. #2: If you charge an hourly rate, chances are, you’re ending up getting paid less and less for the results you provide. Perhaps when you first started working for a client, it took you two hours to write, format and upload each blog post for them; now, you’re able to complete a post in an hour and a half. This means you’ve gone from being paid (say) $100 dollars per post to being paid $75 dollars per post. #3: Today, 100 dollars is worth a little less (in purchasing value) than 100 dollars last year. Think of all the things that gradually go up in price: food, rent, meals out … as a freelancer, it’s perfectly normal to raise your rate to account for this. What if Your Client Stops Hiring You? This is unlikely to happen, unless you’re raising your rates dramatically. If someone has enjoyed working with you, they’ll probably be very happy to pay an extra 10% or so to keep you! Otherwise, they’d have to go through the hassle of finding another writer (editor/mentor/etc) and getting used to working with them instead. If you’re really concerned about this, though, then it makes sense to raise your rates for one client at a time (so that if several do suddenly ditch you, you can rethink for the next few). It’s also a good idea to raise your rates regularly, and by a relatively small amount – e.g. 10% every year, not 30% every three years. How Do You Know When You Should Raise Your Rates? #1: You’ve been freelancing for two or more years and haven’t yet raised your rates (or it’s been two or more years since you last did so). This probably means you’re not charging what you’re currently worth. #2: You’re fully booked and turning away clients. Even if one of your current clients decides not to hire you any longer, you’ll have other clients who’ll be more than glad to take their place. #3: You’re making a low hourly rate. A very rough rule of thumb is that your hourly rate should be at least twice your country’s minimum hourly wage. So, if the minimum wage is £8/hour, which is roughly what it is here in the UK, you should charge £16/hour or more. You should, most likely, be charging significantly more than this, however. Keep in mind that you’re unlikely to be able to bill for much more than half your “working” hours … you’ll also be marketing yourself, maintaining your website, doing admin, and so on. I normally do this by email (because most of my communication with my clients is by email). This also has the advantage of putting things clearly in writing, and giving your client a chance to reflect and respond. I’m really enjoying working with you on [project]. I wanted to give you some advance notice that from January 1st, my hourly rate is going up from [current rate] to [new rate]. This will be reflected in my January invoice (which I’ll send in the first week of February, as usual). 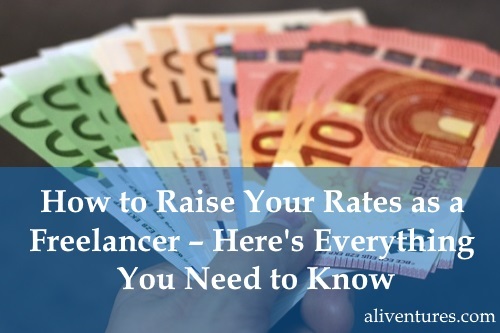 There are some situations where it’s fairly easy to raise your freelancing rates, and you may want to start with these if they’re appropriate to you. Update the figures on your website (if you include your rate there) and simply start charging more! Your new clients won’t know what you charged before, and they won’t know what you’re charging others either – so it’s fine to keep your existing clients on the old rate temporarily. One great reason to charge clients per project (e.g. per blog post) rather than per hour is because it means you’re effectively getting an hourly raise as you get more efficient. For instance, if you get paid $75 for a 1000 word blog post and that initially takes you two hours to write, then you’re making $37.50 per hour. If you then speed up so you can complete that blog post in an hour and a half, you’re making $50 per hour. From your client’s point of view, they’re getting the exact same result! Sometimes, you may be in a position where it’s best to hang on a bit before raising your rates – or where you know there’s a chance your client simply won’t be able to pay you the new rate. If you only started working for someone four months ago, at an agreed-on rate of $50 per blog post, it would be a bit unusual to suddenly start charging more. I’d suggest raising your rate once per year at most for ongoing work. Sometimes, you’re writing for a client who uses multiple freelancers and pays them all a standard rate for a specific amount of writing. (I’m thinking particularly of writing for large blogs or print publications here.) While some will have room for negotiation, others may have a rate that you either take or leave! If this is the case, it’s up to you how you want to proceed. You could tell your client that you want to be paid more per post / per article – but you may find they simply say “sorry, we can’t do that”. Whatever your own situation, though, remember it’s very normal for freelancers to raise their rates from time to time. Clients will expect it and be used to it, if they work with other freelancers. Even if they don’t, most people will completely understand why your prices go up. If you don’t ever increase what you charge, you’re putting yourself and your client in a difficult position. You’ll end up resenting the work you’re doing – or potentially cutting corners so you can get their work done in the minimum time possible, if you’re charging per project. While asking for more money can feel awkward, it will almost always go very smoothly, and it’ll have (obviously enough) a great pay-off. So if you’ve been thinking about charging more but hesitating, maybe now’s the time. Good luck! Congratulations on redesigning the blog. It’s amazing. Let me share my experiences with you. I once worked for a client for two years, and then I raised my rate, and the client didn’t mind it. Similarly, I raised my rate for another client who wasn’t a regular; he agreed after a few negotiations. I do remember a client who said “no” when he came back after a while, and I gave him my new rates. I was okay with it. So I’d say, it’s a part of the game. I think that’s probably true to most writers’ experiences — most clients won’t mind, some might negotiate, and some may indeed say “no” and leave — but so long as you’re not raising your rates dramatically, you’re very unlikely to lose all your clients as once. This was the best piece I read when I searched how to increase your freelance writing rates. I stumbled across some of the blogs ranking number one, two and three, but wasn’t impressed as this. Continue giving useful pieces of advice like these.